On a hot summer day, nothing refreshes like a tall glass of cold water. As you reach to turn on the faucet, most people can generally assume that the water is clean and safe to drink. But exactly how clean is your local water, and how much do commercial filters help the cause? Kathryn Hyduchak ’18 and Nathalia Benavides ’18 are studying water quality as part of the Summer Scholars Program. The students will collaborate on two projects: measuring the effectiveness of household water filters in removing lead and testing local water supplies for any detectable levels of pharmaceuticals. The project is mentored by Jean Smolen, Ph.D., associate dean of mathematics, natural sciences and computer science and director of the program. Peter Zurbach, Ph.D., associate professor of chemistry, is providing assistance with instrumentation. Hyduchak, a chemical biology major from Scranton, Pennsylvania, says that she chose to work on the project because of its global relevance. Benavides, a dual chemical biology and French major from Weston, Florida, adds that there are many other contaminants, in addition to lead, to consider when testing drinking water. Both students sought places in the Summer Scholars Program to engage in high-level research with a faculty member. Smolen, who has been studying water quality with her students for years, praises Benavides and Hyduchak’s commitment to the topic. 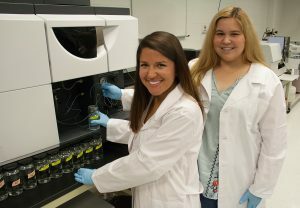 “Because they are passionate about water quality, Nathalia and Kathryn have been delving into the corresponding scientific literature and mastering their analytical techniques,” Smolen says. Outside the research lab, Hyduchak is a member and the scholarship chair of SJU’s chapter of the Phi Sigma Pi National Honor Fraternity, vice president of the Alpha Epsilon Delta Pre-Health Honor Society, and a Resident Assistant. Benavides is a sister and director of academics for SJU’s chapter of the Alpha Phi sorority, secretary of the Biology Club, and a member of both the Sigma Xi Scientific Research Society and Pi Delta Phi French Honor Society.